A powerful speaker that’s capable of causing hearing damage and is used by a growing number of police around the world isn’t merely a “communication device” but, potentially, an instrument of excessive force, a federal court ruled on Wednesday. The U.S. Court of Appeals for the 2nd Circuit rejected the appeals of two New York Police Department officers who had sought qualified immunity in a federal lawsuit that accuses them of using unconstitutionally excessive force when they deployed a Long Range Acoustic Device made by the LRAD Corporation at a Black Lives Matter protest in 2014. 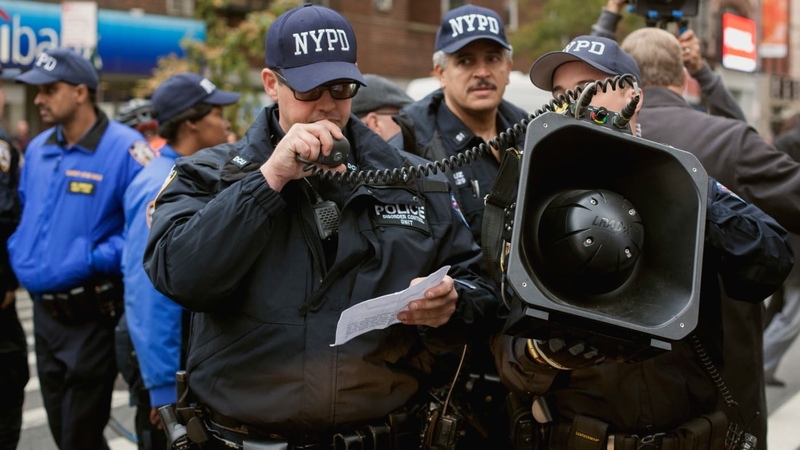 “The NYPD should overhaul its policies and practices regarding LRAD uses to reflect the reality that LRAD’s are potentially deadly tools, requiring meaningful training and supervision to use safely,” Gideon Oliver, who represents the plaintiffs, said in a statement. The New York City law department did not immediately respond to a request for comment. The concerns over LRADs echo those surrounding a range of military-grade gear that is increasingly being used by police across the country, both Pentagon hand-me-downs like armored trucks as well as high-tech surveillance devices like Stingrays. While some local efforts are afoot to bring more transparency and public oversight to new police technologies, what constitutes safe and appropriate use is rarely clear. The six plaintiffs in the New York case were at a Black Lives Matter protest following a Grand Jury’s decision not to indict an NYPD officer in the death of Eric Garner, who died after being placed in a chokehold. During the protest, at about 1 a.m. on December 5, 2014, the officers used the device’s “area denial” tone to force the plaintiffs away from an arrest scene, propelling a series of sharp, piercing beeps at people who in some cases were less than 10 feet away. In the days following the protest, some of the protesters said their ears were still ringing or in pain, while others complained of migraines and vertigo. After one protester sought medical attention for his symptoms, his doctor said the extreme force of the sound gun had pushed a bone in his ear inward, causing nerve damage. When she and other protesters filed suit, a year and a half after the protest, some said they still suffered from occasional tinnitus, and at least one said he still had a persistent ringing in his ears. Writing for the court, Chief Judge Robert Katzmann found that, based on facts and video evidence, purposely using an LRAD in a way that can cause serious injury in order to move non-violent protesters violates their Fourteenth Amendment rights. The court also rejected the officers’ arguments that they should enjoy qualified immunity since there was no legal precedent informing them that “using force in a crowd control context” or against “non-violent protesters” would, or even could, violate due process. 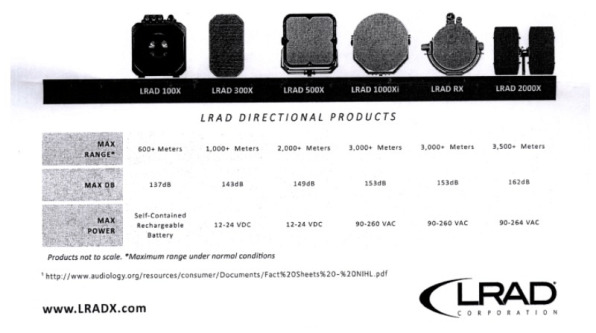 The LRAD at the center of the lawsuit, the 100X, costs between $20,000 to $30,000, but LRAD sells a range of devices that let users generate alarms and “voice messages that are clearly heard and understood from close range to over 5,500 meters.” The NYPD says it has used LRADs sporadically since it first acquired them in 2004 for use during the Republican National Convention, and mostly as loudspeakers. 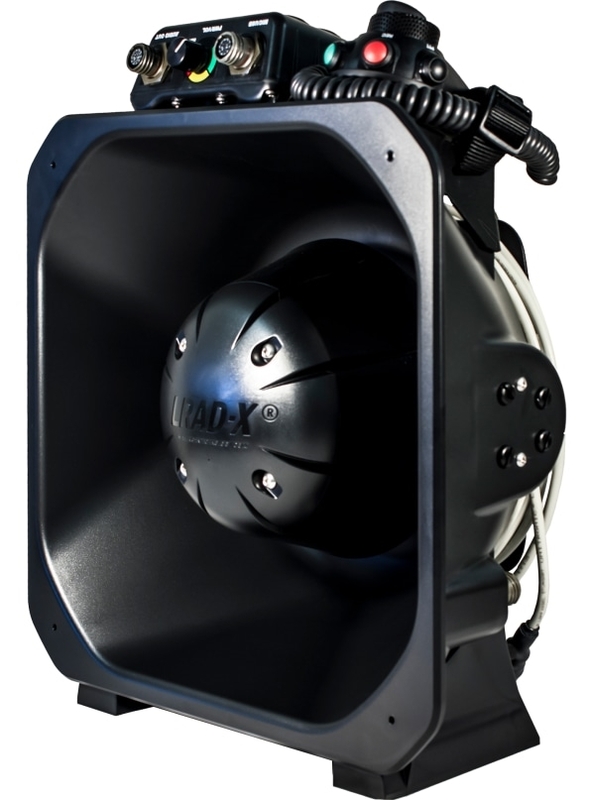 But the devices also have an “area denial” tone that is intended to propel piercing noise that can reach 150 decibels on some later models. Imagine pressing your head against the hood of a car while its alarm is going off. Permanent hearing loss begins with a sound that’s louder than 106 decibels—for example, the sound of an approaching subway car or a nearby chainsaw—for 30 seconds to five minutes. Humans won’t start to feel immediate pain until 120 decibels, about the loudness of a shotgun blast. At 160 dB—a little less loud than a rocket launch—eardrums burst. The company, which boasted second quarter revenues of $7.9 million, has sold the devices to the U.S. Army and Navy and to unnamed customers in the Middle East and Asia. It was used by police during protests in Ferguson, at the Women’s March in Washington, D.C., and at the Cheyenne River Reservation in South Dakota. Chicago, Houston, Las Vegas, and the Massachusetts State Police have purchased LRADs. The lawsuit against the NYPD, Edrei v. Bratton, isn’t the first to be filed regarding police use of LRADs. After police used one during protests surrounding the G20 Summit in Pittsburgh in 2009, an English professor named Karen Piper sued the city, claiming the LRAD gave her nausea and headaches and made fluid leak out of her ear. Pittsburgh ultimately settled for $72,000 and agreed to develop a policy for the safe use of the device. In addition to monetary damages related to their injuries, the plaintiffs in the NYPD case are seeking an injunction that would prevent the department from further deploying and using LRADs without first designing and implementing research, use of force guidelines, and training for the equipment. The lawsuit will now proceed to the discovery phase before Hon. Sweet and then, potentially, to trial.